Fender Champ AA764 Model Tube Amplifier (1969), made in Fullerton, California, serial # A-16684, black tolex covering finish. Height is 14 in. (35.6 cm. ), 17 in. (43.2 cm.) width, and 7 1/4 in. (18.4 cm.) deep. 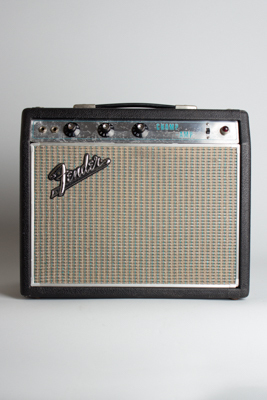 A nice original amp overall, with some light wear but no major alterations. The transformers are dated to 1968 and the pots to the 7th week of 1969, indicating assembly early that year. The Tolex has some small dings but is pretty clean overall, and there are two holes drilled in the upper backplate, possibly for some sort of mounting. The faceplate shows some odd-looking spotty corrosion, but nothing too serious. This is a nice snarly-sounding Champ, the most basic of all Fenders. A good example of the transitional "drip edge" model only seen in 1968-9, as blackface turned to silver. Excellent - Condition.